THE PUBLIC and people who provide cancer and palliative care services have been invited to have their say and help shape future services for Dumfries and Galloway. A period of consultation and engagement is being taken forward by the Macmillan Cancer Pathways and Palliative Care Improvement Project between January 14 2019 and March 25 2019. 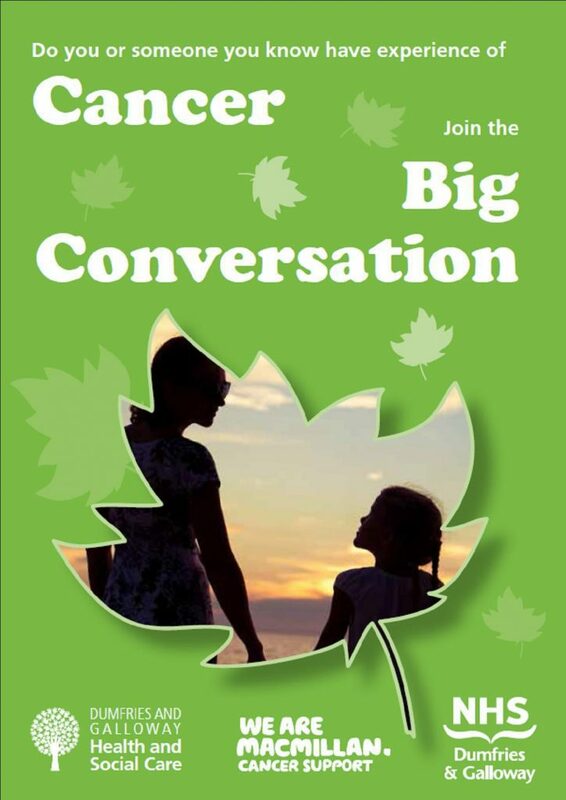 The Big Cancer Conversation is about listening and understanding the experiences and views of people of people affected by cancer, their spouses, partners, families and carers. The Big Cancer Conversation is also open to NHS and social care staff as well as Third Sector organisations, to discover what is working well and where possible improvements could be made. The findings from the Big Cancer Conversation will inform and support the NHS Dumfries and Galloway Board to design and deliver future services. Cancer Lead Stella Milsom said: “This is an exciting opportunity for all of us in Dumfries and Galloway. During the same period, from 14 January 2019 to 25 March 2019, the consultation on the draft Palliative, End of Life and Bereavement Care Strategy will be taking place. The strategy is the first stage in ensuring appropriate access to palliative and end of life care for the whole population of Dumfries and Galloway, regardless of diagnosis or age. Meanwhile, a paper copy will be available from GP surgeries, pharmacies, libraries or from the project team. Anyone who does not wish to complete a survey can speak with a member of the project team or join a small group by contacting the team. An exciting opportunity has meanwhile arisen to try small tests of change to improve the experience of people who receive cancer and palliative services in Dumfries and Galloway. NHS Dumfries and Galloway and the Integration Joint Board are working in partnership with Macmillan Cancer Support who are providing over £200,000 of funding for the project team. The leading cancer charity is also providing an additional £120,000 for local service teams to implement improvement initiatives within health and social care services. Macmillan’s Partnership Manager Nisreen Badiozzaman added: “The increase in people being diagnosed with cancer coupled with the complexity of advancing treatments means Scotland’s cancer care system is facing unprecedented challenges. “A diagnosis of cancer can affect every aspect of life, bringing emotional, financial, practical and physical problems that can last long after treatment ends. That’s why Macmillan is using its financial investments and influence to create a better system – one where everyone with cancer gets access to the best clinical care possible, alongside all the emotional, practical and financial support they need from the moment of diagnosis onwards. If any individual or community group has an idea that they believe could help to improve the experience for people with cancer or palliative care needs and they would like to apply for funding, please contact the Project Team. The project team of Stella Milsom, Cancer Lead, Liz Forsyth, Palliative Care Lead and Project Support Officer Laura Grierson are available to discuss any aspect of the project. Anyone interested in being involved in the project or who would like to chat with any of the team is invited to please contact Project Support Officer Laura Grierson by e-mailing her at dg.MiP@nhs.net or by calling 01387 272725.